Winter Exam season is coming. As April quickly approaches, the average seasoned student will be preparing themselves for the onset of the most stressful time of year: final exams. Similar to the fabled “winter” from the popular HBO series Game of Thrones, exams are dreaded by most and require rigorous preparation of student-friendly rations like caffeine, extra sleep and good study snacks. It’s difficult to say when exams will truly come, as it is not unlikely that the exam schedule will be released later than expected. 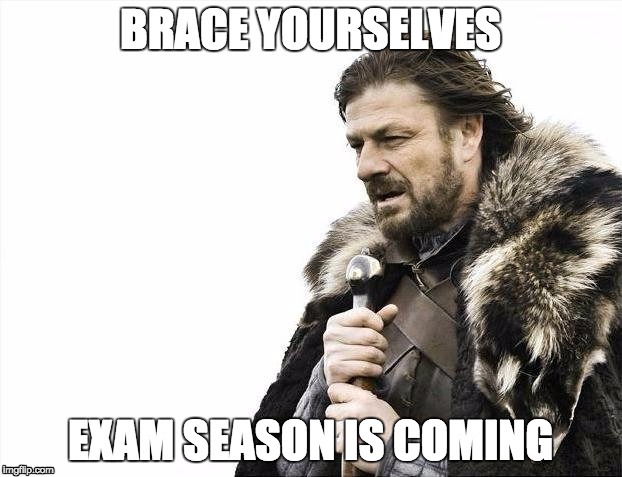 Like the Wildlings, the masterminds behind our seasonal exam schedules are unpredictable creatures and some of us prefer to leave it up to the U of T Gods to decide whether or not we will have consecutive exams (which sadly rob even the most battle-worthy students of their mental perseverance). Gather a small (but attractive) army of well academically trained students who will promise to study with you every night until your exam. Your recruits are so great at being prepared students, that you’re pretty sure that they are more invested in your success than their own. Intelligence aside, they are easy on the eyes and will give you their study snacks if you ask with enough authority. While not favourable in many social circles, as it requires sneaking, lying and general debauchery, the Lannister approach may be the most effective. For the best results, it is suggested you acquire a large inheritance so that good grades would only make you more powerful, which of course, you almost crave. To achieve good grades, you must make “frenemies” with only the best note-takers. Once the notes have been shared, you definitely do not say thank you. This approach may or may not require you to fake your own death. Start off by recognizing that exam season is just another season, and one that you cannot avoid if you are going to be a student of the “Great North(ern)” University of Toronto. You prepare for your tests with diligence, all the while managing to help out your study-friends-in-need… even those who have utilized the Lannister Approach this semester. You believe in yourself and you commit to your studies with honesty and passion. There is a large chance you will also develop an affinity for large snow coloured dogs. During this difficult time, it is easy to lose sight of our actual goals. Are we only easily replaceable minds trained to regurgitate information by choosing (a), (b), (c) or (d)? Is my only identity a soldier on a mission to create the perfect essay thesis? The answer may be yes, but only for a short while. The summer months lay ahead, and unwavering dedication will provide great rewards for those who can commit to their exam season in all it’s stressful glory. Our reward? 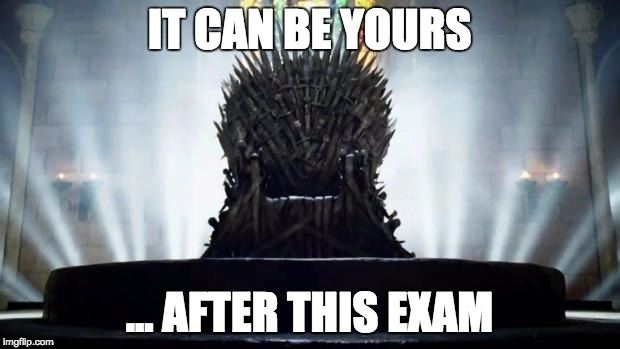 The university student equivalent of the Iron Throne; a finished semester. The best part of our version of the Iron Throne is that once attained, it is just as grand and comes without the threat of an imminent beheading. So carry on and study hard, fellow students… For exam season is long and full of terrors.